Toying with the idea of a used camper van for the summer? Then let us guide you though some things to look out for, and tips and advice on what to buy. Campers come in many differing types and interior configurations, so it’s important that you pick exactly what will work for you. While the mechanicals are largely identical to the panel vans they’re based on, the addition of everything up to and including the kitchen sink means there’s even greater need to inspect your prospective purchase. After all, you’ll want to spend the warmer months living out of it, rather than fixing it. There are two golden rules for buying a used camper van. The second rule is to trust your instincts. You have been developing them all your life and they are there to save your life. So if a gut feeling tells you there is something not quite right about the van or the seller, walk away. Don't be browbeaten by logical argument into buying something you don't want. Problems can arise with vans after you buy them. How much legal protection you have if there’s a dispute comes down to where you bought it from. If you bought your van from a dealer, whether that was a franchised or independent outlet, you’re covered by the Consumer Rights Act 2015. This states that goods must be ‘of a satisfactory quality’, ‘fit for purpose’ and ‘as described’. With a used van, this means it must be in a satisfactory quality for its age and mileage. If you bought the van online, this law still applies and you’re also covered by Distance Selling Regulations that give you the right to cancel the sale within seven working days and receive a full refund inside of 30 days. Within the first 30 days of buying a used van from a dealer, you have the right to reject it and have a full refund. However, the dealer is also entitled to one opportunity to fix the problem, but if that’s not done in a timely and appropriate manner, you can still reject the van and claim your refund. When rejecting a van, you must stop using it completely. Between 30 days and six months from buying a used van from a dealer, you’re entitled to a replacement, repair or refund. After six months, the onus shifts on to the buyer to prove the van had a problem at the time of the sale. In the event of a problem, the first thing to do is contact the dealer as soon as possible. If they offer to fix the fault, be sure you know who is paying for the work and ask for everything to be put in writing. Do not agree to proceed with any work until it’s been agreed in writing. Should the dealer not put this in writing, you can reject the van. However, you must detail your reasons for rejecting it in writing. The dealer may refuse to accept your rejection, in which case you may need to involve Ombudsman Services or Resolver.co.uk. For anyone who bought their used camper with a hire purchase agreement, you have extra protection under Section 75 of the Consumer Credit Act 1974. This makes the finance provider jointly and severally responsible for the fault. In other words, they have to sort it out with the dealer. Using a credit card to pay for some or all of the van's purchase price gives you the same protection. If you paid for the van with a debit card, you don’t enjoy the same level of protection, but the card provider may be able to help through a ‘chargeback’ scheme. You’ll need to claim within 120 days of buying the van and you may have to wait until the card provider has been paid by the dealer before you receive any money. When buying a used camper van privately, you have much more limited protection. The seller must have the right to sell it, which means it’s not stolen or subject to finance. They have to ensure the van is accurately described and must not misrepresent it, for instance telling you it hasn't been in a collision when it has. The van also has to be roadworthy unless otherwise stated as it’s an offence to sell an unroadworthy vehicle. The burden is on the buyer to make all necessary checks when buying privately as the seller doesn’t have to volunteer extra information. So, make sure you keep a copy of the original advert for the camper and all correspondence between you and the seller as proof of the description of the van. Buying a used camper van should be a fun experience; however, there are some important areas you need to address before parting with your cash. These are the top 10 essential checks you must make before buying a used camper van. Not man, or woman - we’re all about equality here - maths, but some cold, raw calculations. You wouldn’t be reading this if you weren’t at least in part interested in the idea of owning a camper, but the reality can be significantly different from the dream. We’d always recommend at least a few trips in hired campers, initially to discover if it’s something you genuinely enjoy, and if you do to help you figure out how you’ll use it and what you might want in terms of equipment and interior layout. There’s no point hauling around four berths if it’s only ever going to be you and your significant other along for the ride. Likewise, do you need a toilet and shower if you’re planning on staying on well-equipped campsites? These are all important considerations, and while we’re definitely not saying don’t buy a camper van - quite the opposite in fact - it’s crucial that you do so as informed as possible. Buying wrong could prove expensive, and put you off camper vans for good. Be sure to test drive a few, as while vans have improved significantly in how they drive in recent years, some are better than others. As with any test drive take some time, let the engine get hot, stop it when it is, then try to start it again. Listen for any knocks and rattles from the suspension and under the bonnet and check every dashboard light and switch actually works. Watch out for any slip from the clutch with manual transmissions, or jerkiness in shifting with automatics. Van’s mechanicals are generally pretty hard wearing by nature of what they’re designed to do, and, usefully, repairing them is relatively inexpensive too. When looking at any camper van purchase take a look at our comprehensive list of used van buying guides for specific mechanical issues relating the base van you might be considering - they’ll give you detailed pointers on what to look for mechanically. By their very nature camper vans have been extensively modified over the panel vans they’re based on. Most will have had bodywork cut to accommodate things like pop-up roofs, additional windows, access to water and waste tanks, extra ventilation, electrical connections and more besides. Take extra time to check the seals around all these modifications, as they can let water in, leading to water traps and, ultimately, corrosion. We’re not suggesting you start peeling back rubber seals, but do have a close look around areas where the bodywork has been modified to check for any signs of water getting in. Open any door, pop-top and see how they sit when they’re closed again. It might sound silly, but have a lengthy poke around all the nooks and crannies inside the camper. If the seller has nothing to hide they’ll not mind you taking out drawers, looking behind cupboards and removing beds, seats and other items to inspect behind and inside them. Check for moisture traps or signs of bodged interior installations, any broken latches, hinges or fixtures, or poorly fixed insulation, blocked ventilation, badly fixed carpets and everything else. It’s not unreasonable on older campers for a bit of age-related wear and tear, but on newer models everything should work and fit correctly. There are plenty of well-established, reputable camper conversion companies out there, as well as a fair share of bodgers and over-ambitious DIY builds. Obviously your expectations here should be in line with your budget, but be sure to spend plenty of time checking, it worth taking a torch to help do so. Habitation tests aren’t currently mandatory for camper vans and motorhomes, but any sensible owner will have had one undertaken annually as part of normal maintenance - after all you’ll be sleeping in it. The annual habitation check by will be undertaken by a camper van, motorhome and caravan approved specialist and covers all the specific areas relating to the camper, not the vehicle itself. That means things like the water and gas systems, pumps and filters, seals, ventilation and the validity of safety equipment like fire extinguishers and fire blankets. A recent habitation certificate will also mean the walls have been checked for dampness, and ensure that all the gas appliances - cookers fridges and suchlike have all been recently inspected. If your prospective purchase doesn’t come with a certificate, ask that it’s done before you buy it - especially if you’re buying from a dealer. Raise the roof, a few times, checking how it fits, how easily it raises and lowers, whether it’s manual or electrically powered. Watch the process inside and out and check that it folds correctly, without pinching the material along the sides. Check the condition of all the brackets and hinges and vents in the pop-up roof mechanism, too. It’s essential to check the locking of the pop-up roof, as the last thing you want is it opening when driving. For your own convenience it’s worth checking the strength of the gas struts (if fitted) that push and hold the roof bed out of the way, as those beds are pretty heavy to push up out of the way in the daytime. Check all the fastenings inside the camper, be it the tie-backs for the curtains, to those fixtures and fittings that keep the cushions and seats in place when you’ve the seats in position on the road. The basics are obvious, you should have a fire extinguisher and a fire blanket in a camper van, as you’ll more than likely have a gas stove inside. Check all the locking doors and covers, as it’s important that things don’t swing open when driving, loose items being dangerous in a camper when you’re on the road. It’s essential to check the seatbelts too, with a camper van’s seats offering more functionality than those on standard cars - the ability to swivel, fold and turn into a sleeping area - it’s not uncommon for the seatbelts to get trapped in mechanisms and get damaged as a result. It’s worth inspecting your seatbelts regularly, and if there’s any fraying or even light surface damage have them replaced. Likewise, make sure they retract properly, and, particularly in aftermarket conversions, seatbelts are fitted where they would be on a series production vehicle. One of the most important checks relates to the gas system. Depending on what camper you buy it will have gas for cooking, heating and even running the fridge, so it’s essential that everything is in order. Check all the gas cylinders and regulators are compatible, butane cylinders will be blue, and propane ones red. The regulators, in the same colours, for each work at different pressures - 28 mbar for butane and 37 mbar for propane. It’s essential that the correct fittings are used, the pipework is all in good condition and there are unobstructed vents and drop holes in floor of the compartment where the gas cylinders are housed. Make sure they’re properly secured, too. If in any doubt, have a Corgi or Calor approved specialist check the gas system. It is wise to have it independently checked annually by an expert - or at least before you intend on using it for a big trip. This should be covered by a Camper van Habitation Certificate check, so invest some money every year for some peace of mind. Depending on your camper van’s specification it will come with water tanks - one for waste and one for fresh water. Check around these for leaks, pipe fitments and on the fresh water one ask when the filter was last changed. The pumps should work, too, so ask that you see the water system in operation rather than just taking a sellers’ word that it does so. Water pipes will be colour coded, blue for fresh water, grey for waste water. Like the gas canisters the water tanks should have some ventilation and drainage in their area to allow any spillages to seep away, the tanks themselves will be vented too, so as to prevent creating a vacuum. If there’s a chemical toilet fitted check it all works satisfactorily, there should be an easily viewed level or full indicator for the waste tank, and, obviously make sure it’s been emptied and flushed through clean before you drive off with it…. Your camper van will have more electrical systems than your car, so make sure it all works. Most use leisure batteries to run the electrics when you’re not able to hitch to an electrical hook up at a camp site, these powering everything from the pop-up roof if it’s electrically raised - often the ignition needs to be on to allow this - to the lighting, the water pumps, fridge and more besides. Make sure any aftermarket systems - televisions, games systems or stereos aren’t putting excessive drain on the system, and check that every light, pump and socket works as it should. Again, it’s worth having the electrical system checked by a recognised specialist electrician before you buy, particularly if your camper is an aftermarket or DIY conversion. Poor wiring could at best mean inoperable systems, and at worst lead to fire. A Habitation Certificate should cover the electrical systems, so have it done before buying and continue to have it inspected every year, as wiring harnesses wear with time, particularly in vehicles. 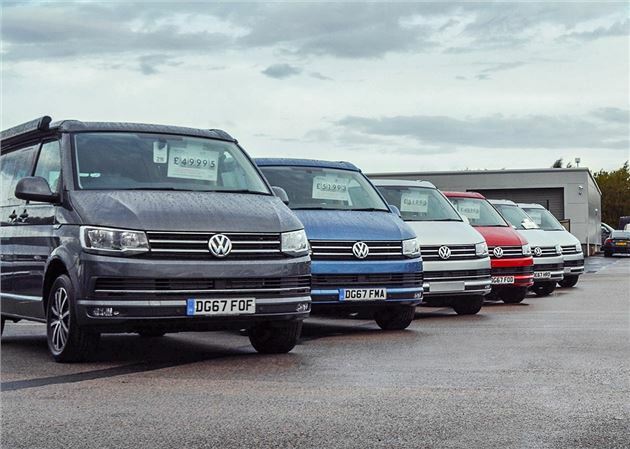 Some main van dealers offer approved used camper van schemes such as Volkswagen's Das WeltAuto. Where the warranty is backed by the manufacturer rather than being simply an insured warranty, these give peace of mind but can come at a fairly high price. Almost all approved used vans are sold with a new MoT. The seller will also vet the van’s history, including mileage, registration and outstanding finance. If something goes wrong during the warranty period, the dealer will cover the cost of repairs, replacement parts and labour up to the market value of the covered vehicle and there's no excess to pay. Most approved used schemes will provide a minimum of 12 months' warranty, along with a 30 day money back promise if you're not 100 per cent satisfied. Others will sweeten the deal with longer warranty, breakdown cover, free insurance and a pledge to cover any potential costs incurred from the vehicle's next annual MoT. As always, it pays to shop around and pitch one franchised dealer against another. There are thousands of used camper van dealers across the UK and many of these independent companies offer good vehicles at keen prices. However, there are some that are less interested in a good deal and customer service. Question is, how do you spot a bad one and avoid being ripped off? It’s not unusual for dealers to only have a mobile phone number now, but make sure you view the van at the dealer’s premises. If they ask you to look at the van at their home or in a car park, alarm bells should be ringing to make you look elsewhere. Before you visit the dealer, check on their website for the kind of vans they sell to get a feel for what sort of stock they have. It’s also a chance to check if they are accredited by the British Independent Motor Traders Association, SMMT, AA, RAC, Motor Codes or Scottish Motor Traders Association. Ahead of looking at a van, carry out a vehicle history check using the registration number. Most dealers will advertise they have already carried this out, but it’s better to make your own check to be sure a camper hasn’t been written off, stolen or is subject to outstanding finance. You should also check the van’s MoT history prior to visiting. This will give a good idea of what work has been carried out and if the mileage correlates to that shown in the advert and on the van' odometer. Is the camper van as the dealer described it? A good independent will be happy to give a full run-down of a van’s condition, age, mileage, condition and service record. If you think they have missed something deliberately, ask about it and, if that answer isn’t satisfactory, you should not buy the vehicle. Trust your instincts. And don’t be brow-beaten into buying a van that’s not suitable for you. If the dealer tries this, it’s because they want rid of a van they are finding hard to sell. When you’re happy with the camper van you’re considering buying, it’s best to pay by credit card or bank transfer rather than cash or cheque. Some dealers will try to charge a fee or percentage for paying by credit card. If so, use the credit card to make a small deposit payment as this give you greater protection if there’s a problem further down the line. Make sure the van comes with all documentation before you sign on the dotted line. If the dealer says he’ll send on the vehicle’s service history, insist it comes with the van before you pay for it. An honest dealer will be happy to put a van through an MoT test so it’s sold with 12 months’ ticket when you collect it. If the dealer refuses to do this, it should sound alarm bells. These people are much maligned, but a proper trader who openly trades from a home of his own is bound by all the same consumer rights laws as a dealer with large, expensive premises. They will be watched fairly carefully by the local Trading Standards Office. The only way they can make an honest living is by offering deals that beat those on offer from the big boys. That 'home of his own' bit is important. If the home trader is operating from rented accommodation you may have no comeback against them. Make sure you're invited you into the house (to make sure it really is the seller's house). And if the trader is the least bit aggressive, shifty, bad tempered or has a vicious looking dog on a chain, make a polite excuse and be on your way. Never buy a camper van in a car park or show, or from a dealer working from a mobile phone number who brings the van round to your house. Always make a history and finance check on vans offered by home traders, and look for verification that the mileage is genuine. Choosing a camper van can be very exciting and this is all the more reason that you need to follow out simple steps to making the right choice when buying from a private seller. The benefit of buying privately are lower prices than at a dealer’s and some buyers prefer the less pressured environment. So, here are our top tips to doing the deal. Do your research. Check online classified adverts to make sure the van you’re viewing is pitched at the right price for its make, model, age, engine and condition. If the price looks too good to be true, it probably is. Some criminals will advertise a camper van that doesn’t exist to collect deposits and then disappear. Vans priced below the market value may also be stolen or ‘cloned’ where they are given the identity of another vehicle that’s legitimate. To avoid these problems, carry out a vehicle history check before going to view a private sale. You’ll need to registration number for this and it will tell you if the vehicle is stolen, written off or has outstanding finance. Only ever view a van at the seller’s house and make sure their address matches that on the van’s registration document. Unscrupulous sellers will give all sorts of reasons why the two don’t match or they want to meet in a car park. However, honest sellers will see you at their home. Arrange to see the van in daylight rather than at night when you might miss damage. If it’s raining, ask to drive the van to a filling station forecourt where you can inspect it in the dry as water can hide bodywork faults. Take a friend or mechanic with you. A second pair of eyes, especially those that know about vans, can help spot potential faults or problems. If you’re not confident about assessing the condition, the AA, RAC and others will carry out an inspection for you for a fee. Scrutinise all of the paperwork; a full service record and folder with receipts from reputable garages is always a good sign. Make sure the mileage corresponds to the van and its condition. Also, check the vehicle registration and Vehicle Identification Number (VIN) tally with the documents. When checking the VIN, make sure it’s stamped into the van’s metalwork or on a fixed plate rather than a sticker that’s easy to falsify. If the inspection and paperwork all check out, it’s time to make an offer. Don’t be afraid to offer less than the seller is asking as they will have factored in some room for negotiation. Having checked out others similar vans, you should have a good idea of what they are selling for. When you agree on a price, you can pay a small deposit or the full amount, but get a receipt from the seller. If the van needs any work before you buy it, agree this with the seller in writing in case there’s any dispute further down the line. If a fault develops with the van within the first 30 days of buying it, you may be covered under the Misrepresentation Act. This states the vehicle must be as described. If it’s not, you can claim the difference between what you paid and what the van is really worth. You may also be able to claim for any repairs or losses as a result of problems with the camper van. It may seem straightforward buying from your mate down the road or your cousin who's getting a new van, but you wouldn't be the first person to buy a disaster zone just because someone in the family was selling it. Obviously, if the camper van is literally being given away, take it. It it's being offered to you at a knockdown price, make sure the price is knockdown by looking it up. If the price is merely a fair price, weigh up what you know about the van against what you're being asked to pay. How long has the owner had it? Is the mileage genuine? How often was the van serviced? Is there anything wrong with it? How much will the faults cost to put right? You may have private reasons for giving too much for a van to an impecunious, elderly or sick member of the family. It's a diplomatic way of helping them out. But otherwise you should not let your relationship with the seller colour your judgement. The van is a purchase you are going to have to live with and if it proves to be a money pit you'll have to live with that too. First and foremost, is it used regularly? Camper vans are based on commercial vehicles which are designed to clock up 200,000 miles in a few years before being sold on or scrapped. They aren't designed to sit unused for eight months of the year. Vehicles that are can be prone to all kinds of age-related chassis, suspension and mechanical problems. You should be looking for a vehicle as new as possible for your money regardless of mileage. A four-year-old camper with 100,000 miles is a far better buy than a 10-year-old van with 50,000 miles. Rust is less of a problem than it used to be and paint is now so expensive it's simply not worth filling a van with pudding and giving it a 'blow over'. But if the van is getting on, check all the usual places - round the wheel arches, under the valences (if they're steel), round the edges of the boot floor, under the carpets if they will lift, in the bottoms of the doors, round the headlights and along the outer tops of the doors. Now on to the interior. Dirt cleans off, but tears in the seats and broken bits of trim are notoriously difficult and expensive to put right. One cigarette burn can be invisibly repaired using new techniques, but a lot of burns will cost you £50 each and the repairs won't be invisible. If the entire interior stinks of tobacco smoke you'll be up against it to get rid of the lingering odour. Has there been a dog in the van? Has it scratched the paint? Don't feel you have to be polite about this to the owners, however nice they may be. It's your money they're after, not your friendship. Unscrew the oil filler cap. If there is a deposit of whitish or creamy-grey 'mayonnaise' underneath, it means one of two things. The van has led a life of very short runs from cold starts, has never warmed up properly and the condensation this has created has mixed with the oil. Engines run like this have less than a quarter of the life of engines run properly. The second problem 'mayonnaise' can reveal is a blown cylinder head gasket. It may be straightforward to replace this, or the head may need to be skimmed because it has warped. Look under the van for leaks. Is there oil on the vendor's driveway? A leak from a cam-cover gasket is common and no big deal, but a bad oil leak from a cylinder head gasket means the head has to come off and, if it does, manifold studs may break and stretch bolts will have to be replaced. Now ask to see the service history. Not a book full of stamps - the actual bills for all the work on the van that the owner has paid for or a computer print-out of its service history. If, from this, you find that the van has been 'overserviced' (had its oil and filter changed every 4-6 months), then be willing to pay more for it than the guides suggest. If the van has a timing belt rather than a chain, in general this needs to be replaced every 60,000 miles or every four years, whichever comes first. On some vans the replacement cycle can be pushed to up to five years or 80,000 miles whichever comes first, but no longer. If the service bills don't show a timing belt change, then budget to have it done. Automatic transmission fluid should have been changed every two years, brake and power steering fluid every two years. If the van has a manual gearbox and the oil in that was changed within its first 18 months on the road, this is a valuable plus point worth paying more for. A full UK driving licence (category B) entitles you to drive a conventional, rigid-axle camper van weighing up to 3500kg. However, it’s vital that you know the weight of the conversion and weight limits of your vehicle as these can be ignored by conversion companies and over-ambitious DIY builders. The maximum gross vehicle weight (GVW) can be found in the driver's handbook or on a plate located next to the bulkhead or by the driver or passenger door. This includes the weight of the vehicle, driver, passengers and the load it is carrying. You should never exceed the GVW. Don't confuse gross vehicle weight (GVW) with the gross train weight (GTW): The GVW is the maximum permitted weight of the vehicle (plus any load it is carrying), while the GTW is the maximum permitted weight of the vehicle plus any trailer being towed and its respective load.